OK, Teresa and Machelle figured out the answer to my Mystery Rooms post of last week. 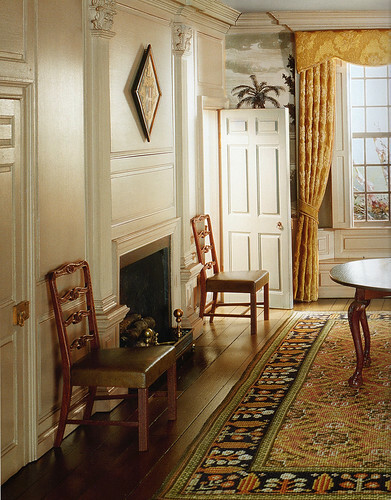 These rooms are ALL MINIATURES! The are all 1:12 scale (1" =1 foot). 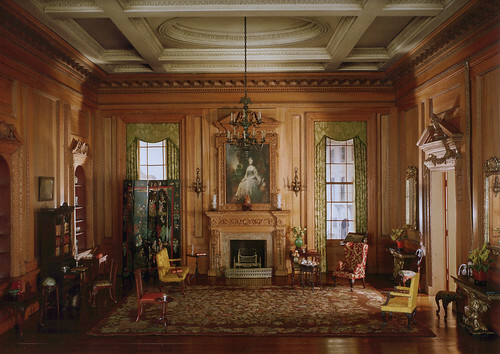 Sixty-eight of these miniature rooms have been on display at the Art Institute of Chicago for several decades, delighting generations of people who have visited them. They were all created in the 1930's by Mrs. James Ward Thorne. Mrs. Thorne was a young Chicago socialite who traveled extensively throughout high society in Europe and America. 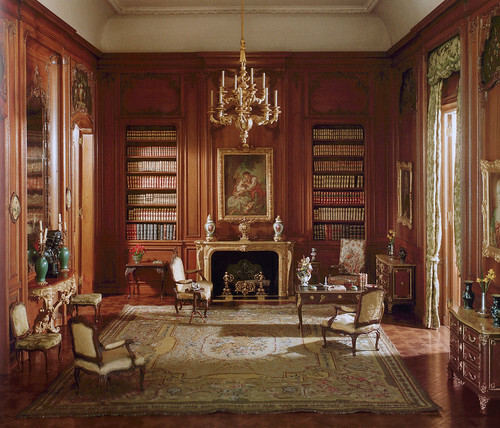 Her lifelong passion was collecting miniatures. After WWI, many of Europe's grand interiors were being dismantled as tastes changed. 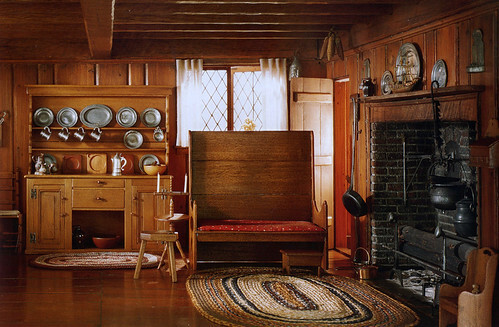 Some museums were starting to create period full-scale rooms to show what life was like in the old days. Mrs. Thorne thought it would be a great idea to create miniature versions of such rooms for educational and historical purposes. 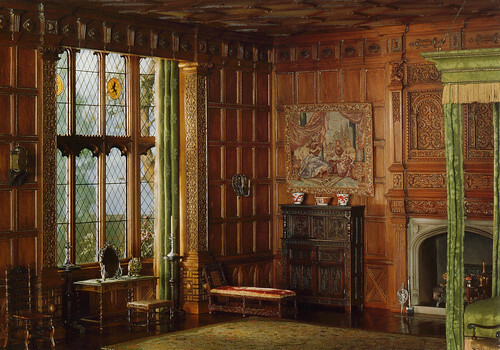 Mrs. Thorne had been amassing expensive miniatures created by European artisans, and creating rooms in which to display them was her intent. 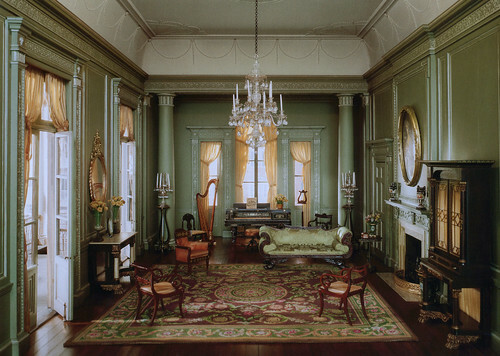 She hired the best team of craftsmen and her first 30 rooms were such a big hit, that she created more, instructing the craftsmen in architectural details and all aspects of her designs. 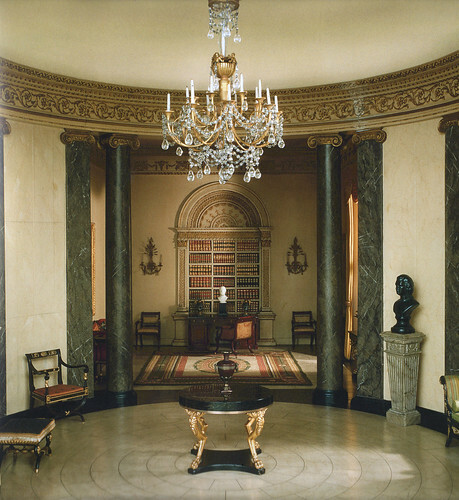 The craftsmen and women designed the furniture, rugs and draperies under Mrs. Thorne's direction. She continued to create miniatures her entire life. The 68 Thorne Rooms at the Art Institute were presented to the museum in 1940 after being displayed at various World's Fairs and museums. A permanent exhibit was finished in 1954. 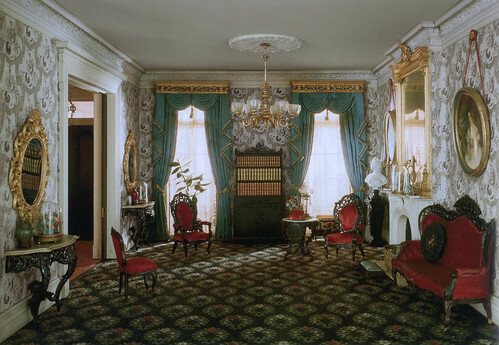 Other rooms created by Mrs. Thorne are on permanent display in the Phoenix Museum and the Dulin Gallery in Knoxville. The Thorne Rooms have been a love of mine since I was a little girl. 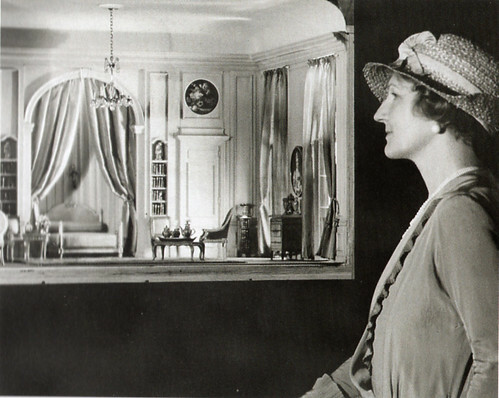 Although I don't have a lot of miniatures of my own, I always had a dream of someday having a dollhouse full of detailed miniatures and rooms just like the ones created by Mrs. Thorne. 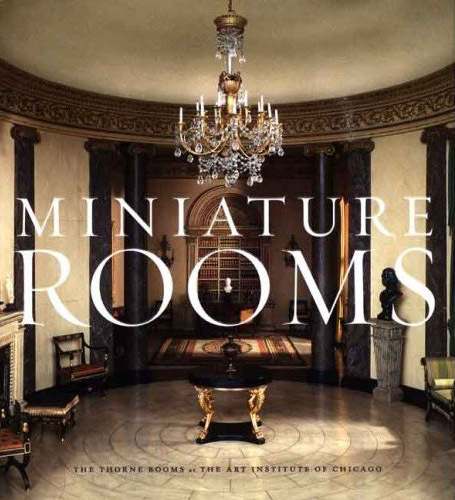 The images shown are from a great book about the Thorne Rooms at the Art Institute of Chicago. Although only 4 of the rooms are from the Victorian period, I love them all. If you haven't seen them, you must make the trip to Chicago someday for a visit to the Art Institute. At our house, Sunday is Grocery Shopping Day. We start with our standard grocery list we print out. I figure out the dinners for the week, circling the items we will need. My husband gathers the coupons, and off we go! Our journey usually lasts about 2 hours, as we visit up to 7 stores. 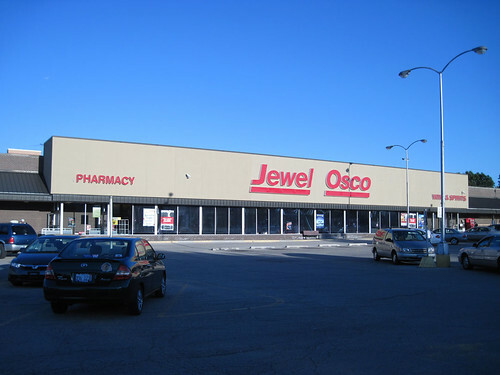 Our first stop is Jewel. It's only about a block from our house. 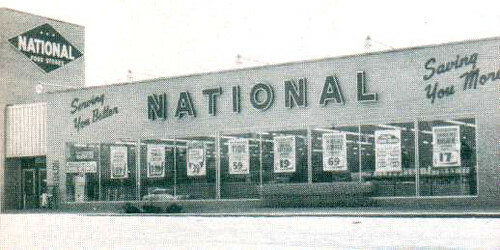 It's a large supermarket, popular in the Chicago area. 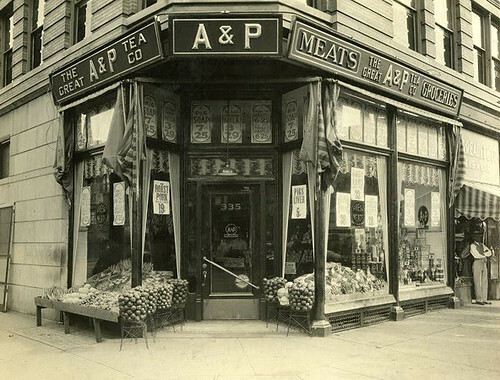 Back in my youth there was the A&P, Jewel Tea and National Tea. These were the big chains. We only had one family car, and my dad took that to work. So my mom & us kids would walk to the grocery store. Some ladies used their own shopping carts to take their groceries home. My mom used the buggy, even after my youngest brother had outgrown it. 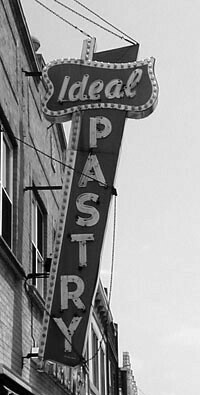 On our outings with my mom, we would often make a stop at the butcher shop, the bakery or the drug store. Next comes Eurofresh, where we buy our produce. It caters to a lot of immigrants who can buy foods imported from their native lands. Growing up in my neighborhood, there was a little corner store every few blocks. We used to walk to Ann's Groceries, which was probably 20' x 20'. The old man behind the counter used a grabber to reach things off the tall back shelves. No cash register was in sight. He would take a stubby pencil and tally your list on the back of the paper bag. He'd also weigh the bulk items for you. I loved Hostess Cupcakes wrapped in cellophane. I'd take the frosting off and eat that first, then lick the cream out of the center—yum! Next is Wal-Mart. We only stop there once in awhile. 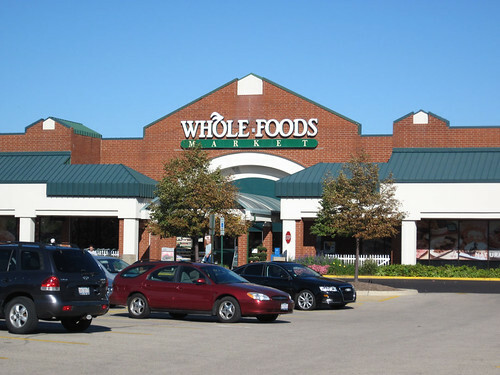 Whole Foods is next on our route. We buy our eggs there because they are free range. They also have a lot of vegetarian choices we don't find in the other stores. I remember when Wanzer's milk was delivered to our house, and Terry remembers a bread truck. My little brother wanted to be a milk truck when he grew up (not the driver... the truck). And who could forget the Good Humor truck! Sometimes, I still run outside when the ice cream truck comes. My grandfather worked with his older brother on an ice truck as a youth (horse & buggy), delivering ice door-to-door. 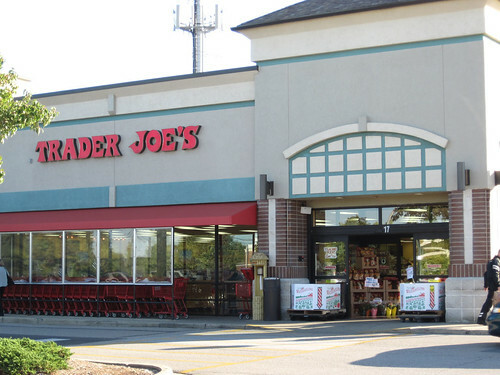 Our last stop is Trader Joe's. This is my favorite store! 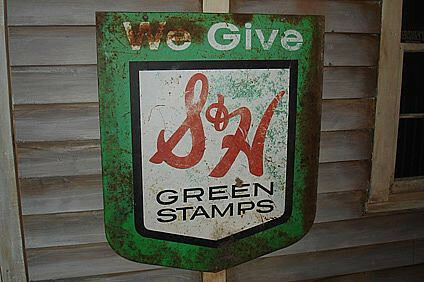 Their prices are great, and they have simple ingredients in most of their packaged foods. In my lifetime, supermarkets have tried to become one-stop-shops for groceries, drugs, liquor, meat, bakery items, health care, restaurants, toys, automotive... you name it. 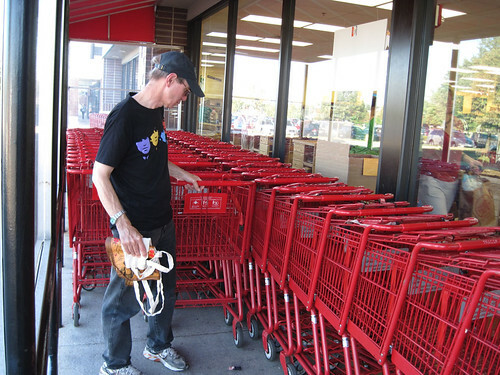 Meanwhile, we've tended to begin going back to a simpler form of shopping. 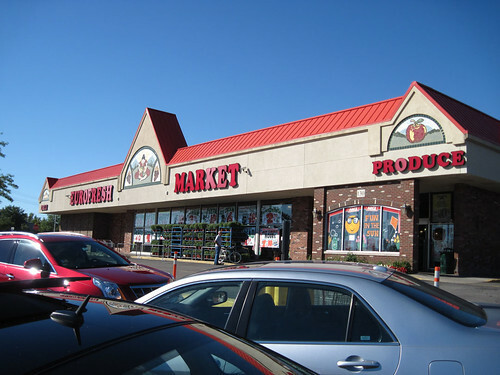 We make more stops at specialty stores to pick up various items. We sometimes stop at Farmers' Markets to pick up fresh local produce. 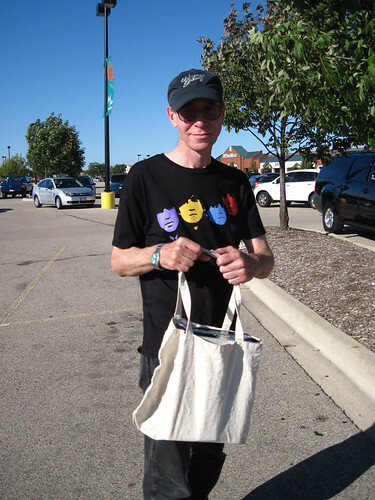 We always bring our cloth bags when grocery shopping, eschewing the paper-or-plastic offered. Sure, we waste a bit more gas because these store take us on a 16-mile round trip journey, but we save overall. No more waxed fruits & veggies. The dented ones are more organic. No pesticides, no preservatives, no added coloring when we can avoid those things. We buy fresh food and cook from scratch as often as feasibly possible with our busy schedules. How did people get their groceries in the 19th century? 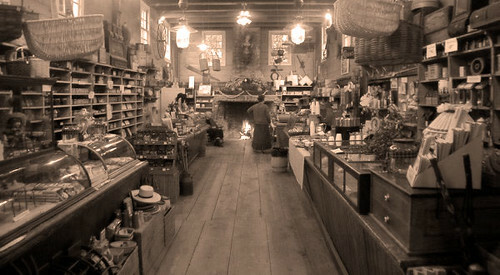 The term "grocery" developed in the 19th century. It primarily meant "liquor store." 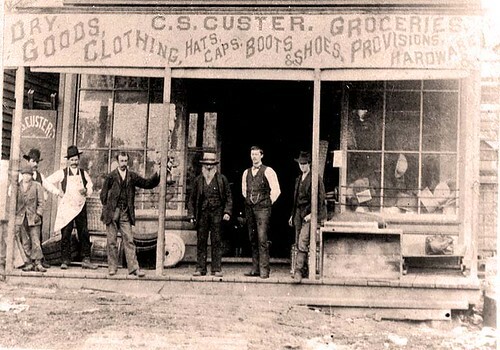 Country and general stores were all over the US. Rural people made regular journeys to nearby towns to pick up things they didn't produce themselves. 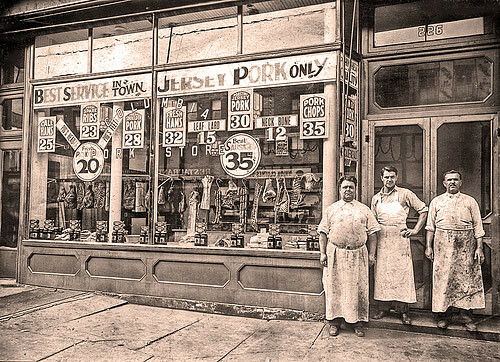 City folk could visit butchers, bakeries and dry goods stores. Open-air markets existed from ancient times to the present, and large public indoor markets were common on the East coast. Fresh local food was available seasonally, and for winter, food could be dried, salted, smoked or pickled. Root cellars kept root vegetables cold and preserved. Canning wasn't invented until 1810. Street vendors peddled many types of food in the cities. 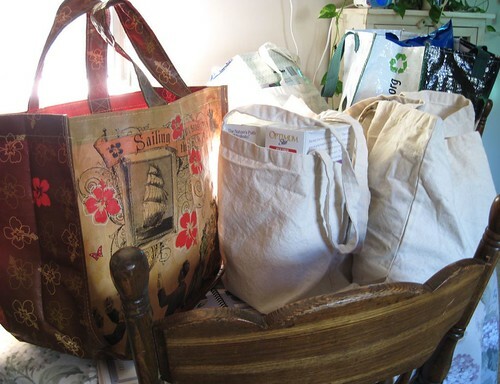 Back from our grocery shopping excursion, it's time to put away all our goods. What a wonderful country we live in, full of abundance. 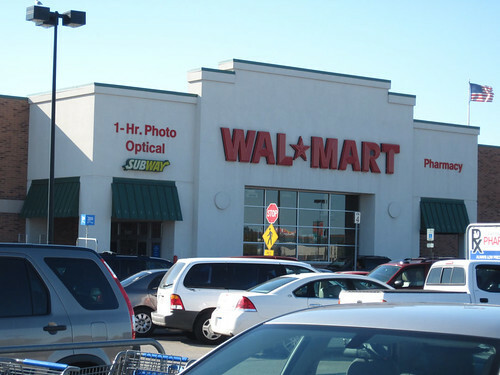 Now there's a Walmart nearly everywhere. Which is good. But it's sad to think of all the mom-and-pop stores that will never return. 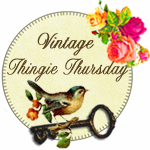 My blog friend Terry at La Bella Vie suggested I post my previous entry about my antique phonograph and records to Suzanne's (the ColoradoLady) "Vintage Thingie Thursday." I've never participated in any of the many different "days" out there in blogland, but I thought I'd give it a try. It looks like a lot of interesting posts so far! 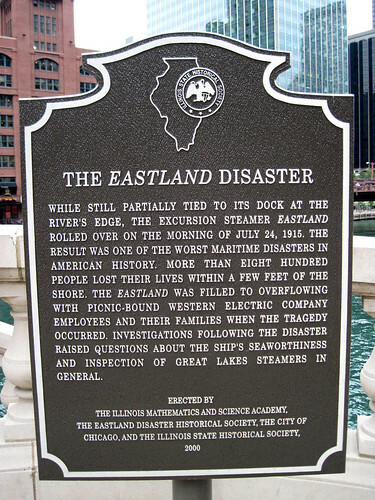 While taking one of my lunch-time strolls in downtown Chicago a few weeks ago, I came across the plaque commemorating the Eastland Disaster. 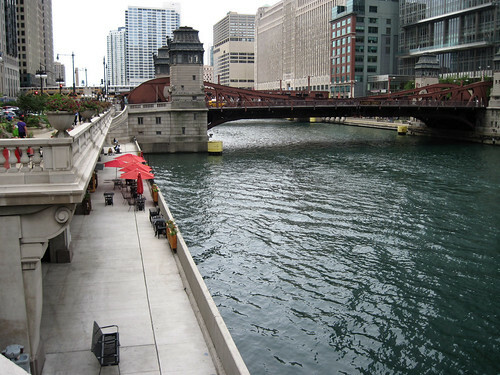 It sits along the Chicago River at Wacker Drive and the LaSalle Street bridge. All my life, I heard stories of the Great Chicago Fire. 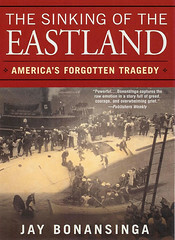 But I never even heard about the tragic story of the sinking of the Eastland until I was an adult. I bet most Chicagoans still haven't heard about this tragedy. 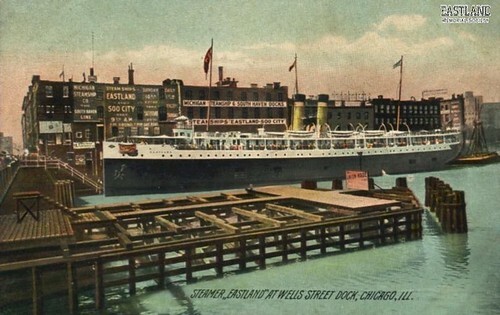 The S.S. Eastland was built in 1902. 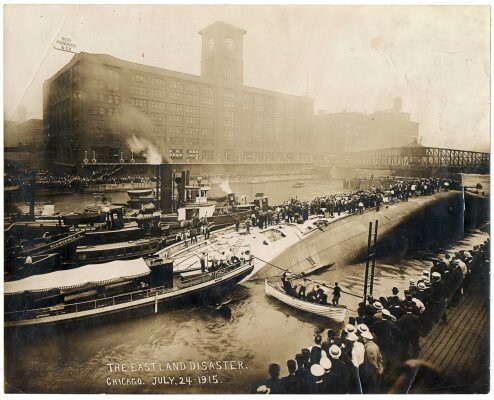 It cruised the Chicago area and the Great Lakes as a tourist ship. 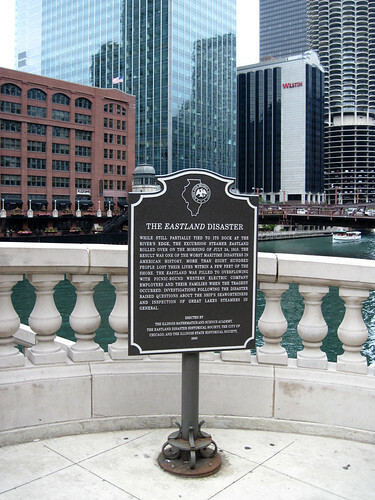 On July 24, 1915, the Eastland docked in its usual place between the LaSalle Street and Clark Street bridges on the south side of the Chicago River. 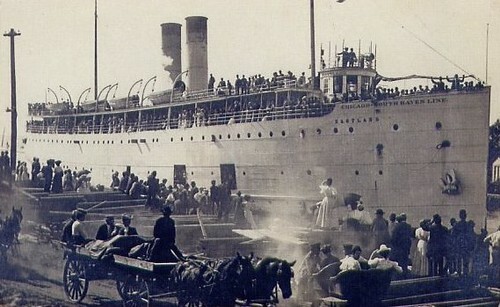 There, over 2500 employees of the Western Electric Company plant of Cicero, Illinois and their family members boarded the ship for a company-sponsored picnic cruise to Michigan City, Indiana. The ship had design flaws, making it top-heavy. 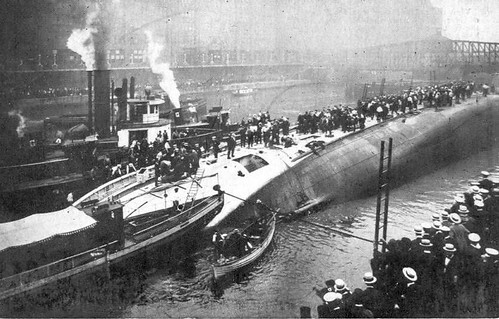 Soon after boarding and before the ship could even leave the dock, it tipped over and sank into the 20-ft. waters. 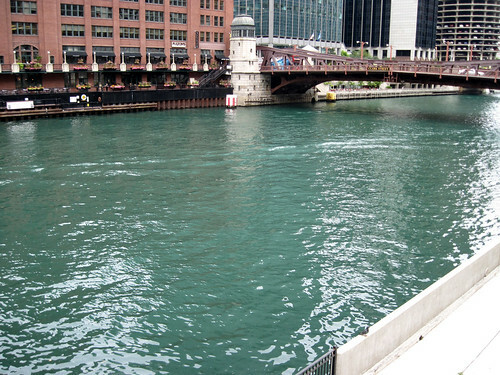 Chicago police and firefighters quickly rushed to the scene and began rescue efforts. ... and how the same view looked on that tragic day. 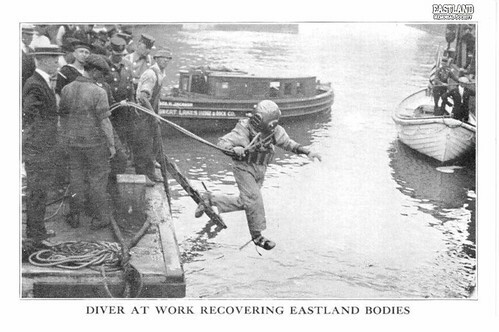 Divers were sent into the waters when the rescue effort became a recovery effort. 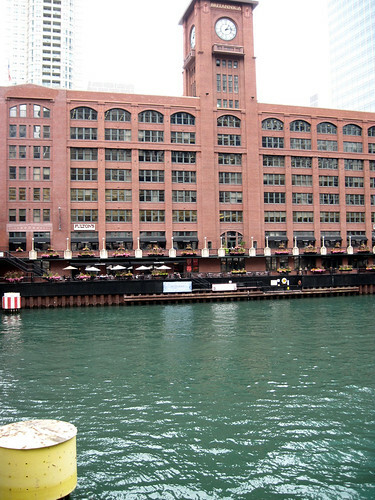 The Reid Murdoch building on the north side of the river still stands today. This central food-processing plant became the staging area for emergency responders during the rescue. ... and the same view a few weeks after the disaster. Here you can see the efforts being made to raise the ship upright. 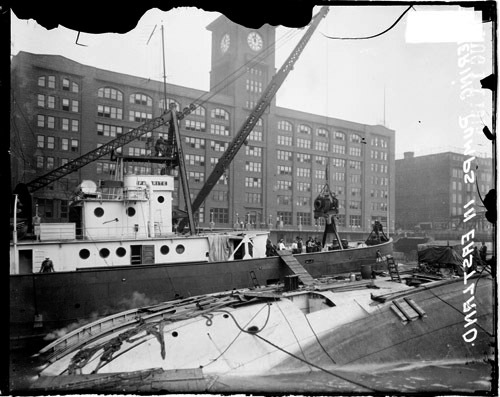 After being righted and towed away from the scene, The Eastland was sold to the US Navy, repaired and retooled as a gunboat, renamed The USS Wilmette, and finally dismantled after WWII. 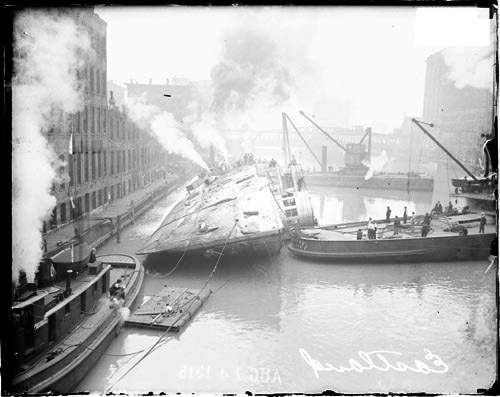 In all, approximately 845 people lost their lives that day, making it the 3rd worst ship disaster in U.S. history and the largest loss of life in the United States from a single event during the 20th century. 22 entire families were completely wiped out. Why was this incident all but forgotten? 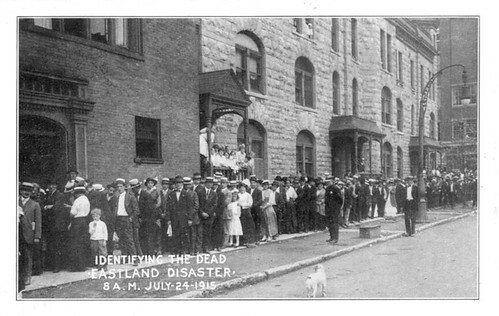 Was the event just too tragic and painful to remember? 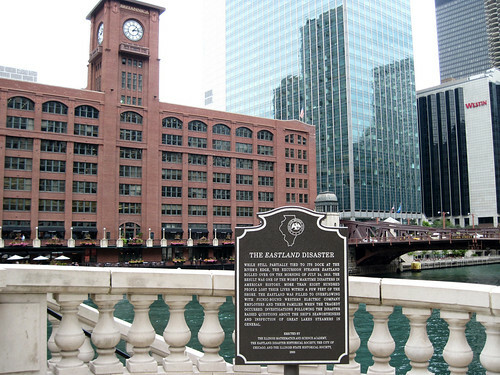 The first plaque was erected in 1989. After being vandalized and finally stolen in 2000, a new plaque was commissioned and erected in 2003. 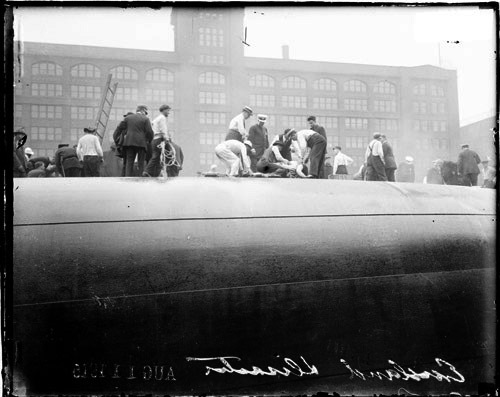 The Eastland Disaster, a wonderful YouTube video. Very well done.